It’s no secret that Christiane Mack, Head of Content Strategy and Operations at Condé Nast, has a love for ranunculus. With layers and layers of tissue-thin petals, much like a delectable mille-feuille pastry, the intricate blooms look nearly too perfect to be real. Thanks to her love of gardening (passed down from her parents and grandmothers), Mack knew chartreuse hydrangeas and glossy gardenia leaves would be the perfect companion for the ruby ranunculus. 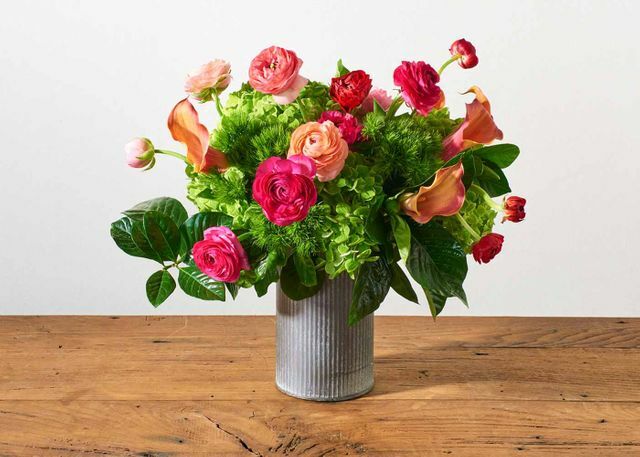 Both the foliage and the drab tin vase allow the jewel tones of the ranunculus to pop out and play the starring role.